Originating from cross-country skiing, Nordic walking provides aerobic (heart and lung) physical activity and resistance (muscular strength) exercise at the same time through the use of specialist Nordic walking poles that are pushed back by the upper half of the body to help propel the whole body forward. 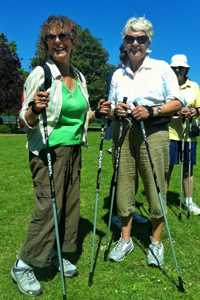 Learn this fascinating technique by attending a four-week Nordic walking course for beginners at a discount price that includes use of the specialist poles. The discount price is offered to people who want to join the free Nordic Walks run by the Council's Healthwalks Scheme. Meet at Hove Park Cafe for the first three sessions. The final session takes place in Stanmer Park and we will meet at Stanmer House.